Castelli Flusso full zip jersey. Prosecco GT main body fabric wicks moisture away. Mesh side panels and shoulder stretch zones for great fit. Full length YKK vislon zipper. Reflective Hi-Viz Strips for enhanced visibility. 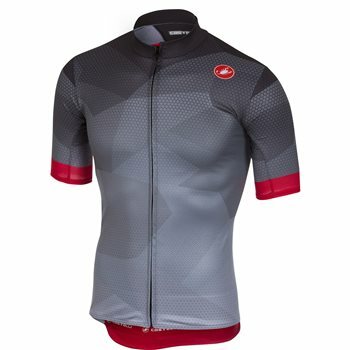 Castelli make high performance technical cycling clothing. When choosing shorts or jerseys you should normally base your choice on chest and waist size. The clothing should fit snugly for aerodynamics but not restrict movement. Please refer to the charts below for fitting. NB - you should normally pick one size smaller for armwarmers. If you use an XL jersey then chose a size L armwarmer. We stock a range of Castelli at our retail shop in Pennyburn where you can call in to try sizing before you buy.